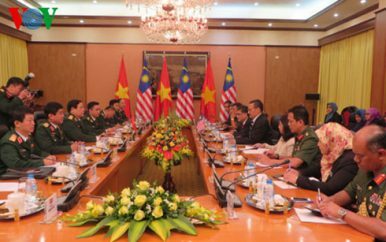 Uncategories What’s Next for Vietnam-Malaysia Military Ties? Earlier this week, a high-level Vietnamese military delegation paid a visit to Malaysia. The trip, along with the meetings held between officials on both sides, is part of a continuing effort by the two countries to explore opportunities to broaden and deepen their bilateral defense cooperation, even though that collaboration has been evolving more slowly than the rhetoric suggests. Vietnam and Malaysia share a relationship that extends into the defense realm, with both countries inking a memorandum of understanding (MOU) on bilateral defense cooperation back in 2008. The scope of ties includes not only issues that make the headlines like terrorism and the South China Sea – both countries are claimants – but also others such as countering transnational crimes, managing illegal fishing, and sharing experience on peacekeeping, which Hanoi is looking to play a bigger role in (See: “Should Malaysia Rename its Part of the South China Sea?“). Though some advances have been made in bilateral defense ties over the years, including the signing of a letter of intent in 2015 and an agreement to establish a High Level Committee (HLC) to structure defense, in reality in some areas the pace has been slower than the rhetoric has suggested. 2018 offers an opportunity for both sides to further boost defense ties, with it marking the 45th anniversary of bilateral diplomatic ties as well as the 10th anniversary of the original MOU on defense cooperation. As part of that effort, from March 4-6, a high-level Vietnamese military delegation led by Senior Lieutenant General Phan Van Giang, the chief of the General Staff of the Vietnam People’s Army (VPA), made a visit to Malaysia. The trip saw a series of meetings in Kuala Lumpur, including Giang’s meeting with Malaysia’s Chief of Defense Force General Raja Mohamed Affandi, as well as other interactions, including a visit to Malaysian Army Command West of the Malaysian Armed Forces. Both sides took stock of the state of their bilateral defense ties in various areas and also discussed ways that they could broaden relations. Few details were publicly released, but official Vietnamese accounts as well as state media noted that both sides would look to next steps such as the holding of joint working groups on bilateral defense cooperation. The framework of the HLC and working groups have become ways for the two countries to explore collaboration in areas such as defense industry collaboration, including maintenance repair and overhaul (MRO) and logistical support.